Food Blogga: Balsamic Roasted Cippoline Onions from Frieda's, Inc.
Balsamic Roasted Cippoline Onions from Frieda's, Inc. Onions have their place. I wouldn't dream of starting a marinara sauce without sauteed shallots. Nearly every soup I make starts with sauteed brown onions. Red onions enliven fruit salsas, and scallions add depth to guacamole. And let's face it, a bratwurst without grilled Vidalia onions is a crime. What about cippoline onions? Believe it or not, they've never even visited my kitchen, that is, until a few weeks ago. Now, they're nestled in the onion basket alongside my beloved shallots and brown onions. Why this sudden change of heart toward cippoline onions? It's because of Frieda. I'm unable to resist her charms, and if you taste her cippoline onions, you'll find yourself equally captivated. These cippoline onions are from Frieda's Inc., The Specialty Produce People. I've had the pleasure to do some recipe development with Frieda's and have tasted many of their products from onions and potatoes to pine nuts and dried cranberries. The cippoline onions are wonderful. Cippoline onions which look like little flying saucers are naturally sweeter than most onions, and roasting them only enhances their sweetness. In the recipe below, the contrasting flavors of tangy vinegar and sweet sugar add depth of flavor while the fresh rosemary lends fragrance and earthiness. Serve these balsamic roasted cippoline onions with roasted pork tenderloin, grilled steak or chicken, or even a bowl of wild rice for a hearty vegetarian entree. Then make some room in your onion bowl for the cippoline onions you'll be buying next time you're at the supermarket. 1 pound cippolini onions, preferably from Frieda's Inc.
1. Position a rack in the center of the oven and preheat to 350 degrees F.
2. To easily remove the onion skins, cut a small x in the bottom of each onion. Place onions in a pot of boiling water for 2 minutes. Drain and plunge in a bowl of cold water for 2 minutes. Then the skins will easily slide off with even the gentlest nudge. Scouts honor. 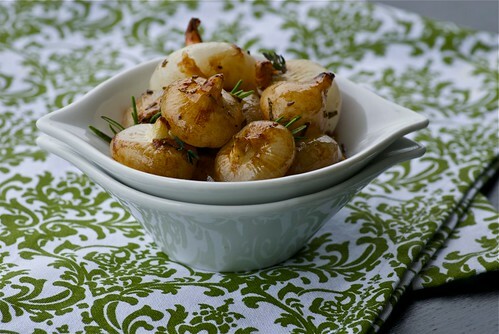 Place onions in a large glass or ceramic baking dish. 3. In a small bowl, whisk olive oil, balsamic, brown sugar, rosemary, salt, and pepper. Pour over onions and toss to coat. Cook 40 to 45 minutes, turning a couple of times, until the onions are browned and tender and the sauce thickens and becomes bubbly. These look to die for, lovely dish. I have never seen those here in the UK, but will keep my eyes out for some. Great recipe. These are new to me -- will have to get a hold of Frieda's! I love all kinds of onions and put them in (almost) everything. I'll be trying these! hazel-I'll be an active club member! sylvie-They're something special. Hope you find some. cara-I know what you mean, but these definitely stand on their own as a bona fide side dish. rosemary-Check out Frieda's. They have exotic and hard-to-find produce. Happy hunting! How beautiful is this dish of onions? I could eat it all - all by myself. Gimme a fork. I live in Australia and NO vidalias or walla walla sweets. We have white onions or brown onions or red onions. That should be enough for anyone I'm told. They just don't understand. I want some of these onions! I was reading that cippoline onions originated I believe in Sicily. I love it when I can find them at the grovers! Ah, balsamic and onions - two ingredients that work together so well! Great recipe and post! Yes I agree, onions are essential to many meals. I love the smell of cooking onions,sometimes even more than the main dish itself. val-Yes, I read that somewhere too. Another reason to be thankful for the Italians. culinarycache-They go together like pb and jelly.